Rotational Discs provide smooth rotational training and are useful tools for improving strength, rotational stability, balance and Range of Motion (R.O.M.). Many of our daily movements require rotational stability in our hips and shoulders in a weight-bearing position (climbing stairs for the hips or pushing open a door for the shoulders). Rotational Discs provide smooth rotational training and are useful tools for improving strength, rotational stability, balance and Range of Motion (R.O.M.). 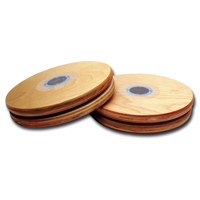 Commonly used in dance studios and for hip rehabilitation, Rotational Discs are friction free, minimizing the torque applied to the joints thereby decreasing the strain that could lead to injury. Use of Rotational Disc can enhance most exercise programs. Only your imagination will limit the exercise possibilities and nothing will limit the fun! Diameter of each disc is 27cm.